Ace of Base was a Swedish pop group, originally consisting of Ulf Ekberg and three siblings: Jonas Berggren, Linn Berggren and Jenny Berggren. The group released four studio albums between 1992 and 2002, which sold more than 30 million copies worldwide, making it the third-most successful Swedish band of all time, after ABBA and Roxette. Happy Nation (reissued as The Sign) is one of the best-selling debut albums of all time, and was certified nine times platinum in the United States. It was the first debut album to produce three No. 1 singles on the Billboard Mainstream Top 40 chart: "All That She Wants", "The Sign" and "Don't Turn Around". Following the formal departure of singer Linn in 2007, the band performed a series of concerts as a trio in Europe and Asia between 2007 and 2009. Jenny Berggren said in November 2009 that she would be taking an indefinite leave of absence from the band to focus on a solo career. In 2009, Jonas and Ulf recruited two new female vocalists, Clara Hagman and Julia Williamson, and released The Golden Ratio in September 2010. Clara and Julia departed from the group in 2012, and in March 2015, the compilation album Hidden Gems featuring unreleased songs and B-sides from the group's inception through 2005 was released, with promotion for the album being handled solely by Jonas and Ulf. In 1987, following a number of years as part of a new romantic and punk covers band called G Konrad, Jonas Berggren formed a band with two friends, Johnny Lindén and Niklas Tränk, for a school project; his sisters Malin, called "Linn", and Jenny, joined as singers. The new band went through several names: Kalinin Prospect after an avenue in Moscow; CAD (Computer-Aided Disco); and Tech-Noir, French for black technology, after a nightclub in the film The Terminator. They toured the clubs of Sweden with self-written material, techno inspired by the likes of The KLF and Snap!. Johnny left the group in 1989, and Niklas made his departure known by failing to appear at a performance, instead attending a Rolling Stones concert on the other side of town. Jonas asked his friend Ulf Ekberg to stand in for Niklas. The new quartet sought a new name to make a fresh start. Linn was reported to have said: "No one could pronounce the name of the group and nobody could remember it." They settled on Ace of Base after Ulf was inspired by the music video for the Motörhead song "Ace of Spades". However, the band continued to struggle to gain recognition, partly due to the preference of heavy metal over techno in their hometown, according to singer Jenny. In 1991 they responded to a newspaper ad by producer John Ballard, who was looking for new talent. He was somewhat unsure about their potential, but did pass them on to Klas Lunding at Telegram Records, who helped them record an early demo for the song "Wheel of Fortune" in their newly renovated studio. A Jamaican reggae band resided in a studio next door to theirs, leading to a collaboration of ideas. This resulted in a fusion of reggae with pop which became the band's trademark sound. "Wheel of Fortune" did not convince Telegram to sign the band, and other labels in Sweden still showed no sign of interest. The demo was eventually sold for a small price to the independent Danish label Mega Records in March 1992. "Wheel of Fortune" was re-recorded and released as a single in Denmark in May, but it failed to chart. A small-budget music video was shot and directed in a small studio by Viking Nielsson and in September, after two failures, the single finally charted. While "Wheel of Fortune" was a modest success, a different song led Ace of Base to take off internationally. After hearing Kayo's "Another Mother", a top 20 hit in Sweden, the band decided that it was exactly the sound they wanted to create. They contacted the song's producer, Denniz PoP, and sent him a demo of a song they called "Mr Ace". The tape got stuck in the cassette tape player in his car, so he listened to it over and over again, which helped him decide to produce the song. The song became "All That She Wants", and upon its release in October 1992, it quickly climbed to No. 1 on the Danish chart while the previous single was still sitting at No. 2. Keen rushed out an LP for the Christmas market, Mega Records pressed the band for an album and it was hastily recorded, mixed and released within a few weeks. The album, Happy Nation, was an instant hit in Denmark, and its success prompted interest elsewhere in Europe. A Pan-European license was signed with Metronome/PolyGram (now Universal Music), but they were turned down by the American division. Within a few months, "All That She Wants" had reached No. 3 in Sweden and had spent eight weeks at No. 1 in Germany. In various European countries, "Happy Nation" and "Waiting For Magic" were released as further singles following the release of the album. In May, "All That She Wants" continued to be a hit all around the world and topped the chart for three weeks in the United Kingdom. In November 1993 it repeated the feat in Australia, where it also peaked at No. 1 for three weeks. However, despite Mega Records's hard efforts to secure a distribution deal in the United States, the response was always the same: "This band will never work in the States." Eventually, however, Clive Davis, founder of Arista Records, thought otherwise, and by the end of 1993 "All That She Wants" had made its way to No. 2 on the Billboard Hot 100 in the United States. In order to freshen up the album for American release, Davis insisted that some new tracks be recorded, including "The Sign", which became the new title track for the album and the second American single. It was even more successful than the first, spending six weeks at No. 1 and becoming the best-selling single of 1994. It was also a major hit in Europe, peaking at No. 2 in the UK and Sweden and at No. 1 in Germany; in Australia, "The Sign" spent the entire month of May in the No. 1 position, becoming the country's fifth highest-selling single of 1994. Due to fears of imports from the United States, the original European album was re-released with new tracks under the name Happy Nation (US Version). This was the first version of the album to chart in Australia, in April 1994. Collectively, the different versions of the album reached the No. 1 position in at least 14 countries, and sold more than 25 million copies worldwide. Two more singles were released: "Don't Turn Around" and "Living in Danger". The former was originally recorded by Tina Turner, as the B-side of her single "Typical Male". Davis suggested that the band record the song and it was yet another worldwide hit. The latter was a moderate chart hit in most countries where it was released, and was performed at the first ever MTV Europe Music Awards held in Germany. By the end of 1994, they were a worldwide commercial success. In April 1994, an obsessed German fan broke into the Berggren family home, brandishing a knife. After managing to restrain her, the band decided they needed bodyguards. However, they were unable to take time to reflect before starting work on a second album because their record companies all over the world were demanding a swift follow-up. To speed up the process, instead of Jonas and Ulf writing the bulk of the album, each member was encouraged to submit their own tracks for consideration. In the end, 17 tracks made the cut of the second album, titled The Bridge. It marked a considerable change of direction in sound; out were the reggae and club sounds that made the group so popular in favor of a more experimental sound and several ballads. The lead single, "Lucky Love", however, was a mainstream pop record, and upon its release in October 1995, it became the band's first No. 1 single in Sweden. This came as a pleasant surprise to the members, as they had found that their fellow Swedes had been their harshest critics. It charted at a more modest No. 13 in Germany, No. 20 in the United Kingdom and No. 30 in Australia. Arista Records instead opted for the pulsating dance beat of "Beautiful Life" for the first single in the US, where it peaked at No. 15. "Beautiful Life" was released as the second single from the album in most countries, reaching No. 15 in the UK and No. 11 in Australia, while "Lucky Love" was remixed in a new acoustic form along with a new video for the second US single from the album, peaking at No. 30. The Bridge was certified platinum in 14 countries, but the phenomenal success of the band's first album proved difficult to follow. "Never Gonna Say I'm Sorry" was released as the third single from the album and achieved moderate success in Europe, but it failed to chart on the Hot 100 in the US. In February 1996, the band performed at the Viña del Mar Festival de la Cancion in Chile, topping the bill alongside 2 Unlimited. Linn's image was blurred on the cover art of Flowers and Cruel Summer. After this, Ace of Base disappeared from the limelight for a while, emerging only in April 1997 for a performance at the World Music Awards and in July 1997 to perform at a concert to celebrate the 20th birthday of Princess Victoria of Sweden. They were given as much time as they wanted to produce their third album, much of it being recorded in Jonas's own studio, "The Barn". When it was finally released in June 1998, the band declared it their best album yet. It was titled Flowers because they believed that the songs, wildly different in style including Motown and gospel influences, resembled a varied bouquet of flowers. Fans were surprised to see that singer Linn had relinquished lead vocal duties to sister Jenny, and on many promotional photos, Linn's face was blurred. They were reassured that Linn was happy with her new backing role in the group, and many reasons were given for her decision, including her having damaged her voice, fear of flying putting her off from traveling around the world and her dislike of fame. Linn has relinquished the role of front vocalist and delegated her singing duties to sister Jenny. Linn has had recurrent problems with her voice since album II, The Bridge, and would not be able to withstand the rigors of touring. As it represents a significant change, the band has decided to concentrate all visual attention on Jenny for the time being. The radio-friendly single "Life Is a Flower" was certified the most-played track on European radio for 1998 and sold more than 250,000 copies in the UK, peaking at No. 5; the colorful video of the same name was produced and directed by Andreas Neumann. British label London Records had requested the band record the 1983 hit "Cruel Summer", by Bananarama and it was selected as the second European single. Deciding that "Life Is a Flower" was "too European in nature", Clive Davis pushed "Cruel Summer" as the lead-off single for the United States, and it brought Ace of Base back into the US Top Ten for the first time in four years, being certified gold. The album was also renamed Cruel Summer and featured a different track list compared to the European release. For this version of the album, Davis persuaded a reluctant Linn to record the Billy Steinberg-penned ballad "Everytime It Rains". "Life Is a Flower" was re-recorded as "Whenever You're Near Me" and four other songs originally on Flowers were remixed and edited for the US release. "Whenever You're Near Me" was released as the second single from Cruel Summer, peaking at No. 76. "Travel to Romantis" and "Always Have, Always Will" were further singles in Europe while "Everytime It Rains" was issued as a single in the UK along with a repackaged edition of Flowers released only in the UK. Singles of the 90s, a compilation of sixteen hit singles, was released in November 1999. Its first single, "C'est La Vie (Always 21)", charted modestly in most places where it was released and went on to become a surprise No. 1 hit in Spain. Attempting to capitalize on the success of the previous single, "Hallo Hallo" was released with special remixes just for the Spanish market. The album's marketing push closed with the limited radio-only single release of "Love in December". Greatest Hits was released for the American market in March 2000. "Hallo Hallo" was initially planned to be the first single from the compilation, but in the end, it was not included at all. "C'est La Vie (Always 21)" served as the only new recording on the American release. "Everytime It Rains", previously included on the Cruel Summer album, was released in a new remixed form as a radio single in the US, becoming the only form of promotion for Greatest Hits. With minimal promotion, the album and the single failed to chart, with the former selling fewer than 5,000 copies in its first week. Ace of Base released its fourth studio album, Da Capo, on September 30, 2002, in Europe, and in Japan through Toshiba EMI with a different cover and three bonus tracks. The album had originally been planned for release in mid-2000, but was repeatedly postponed due to record company complications. The album received only a soft release in the United Kingdom and was not released in America or Australia, though a release was planned for the United States in 2003. The album is named for the musical term da capo, which translates as "back to the beginning". It was intended to be a return to the band's earliest sound. Although the album entered the album charts in many European countries, it was not as successful as previous releases. Only Jenny and Ulf went on a promotional tour of Sweden, Denmark, Norway, Finland, Germany, Poland and Austria. Jonas didn't attend promotional activities because "it was better to be two then" because it led to "less questions" about Linn's lack of participation. Linn attended only one performance in Germany, which was her last public appearance. The first single release from the Da Capo album was "Beautiful Morning", which peaked at No.14 in Sweden and No. 38 in Germany, where it was followed by "The Juvenile"; this was used for a Christmas campaign by German TV channel RTL. "The Juvenile" was previously written for the GoldenEye James Bond movie in 1995. However, Arista, the band's American record label at the time, shelved the idea. In Scandinavia, Edel-Mega released the album's opening track, "Unspeakable", as the second single, but its poor chart performance ended the promotion of the album prematurely. The band remained out of the spotlight throughout 2003 and 2004, although Jenny kept busy by performing solo live performances in several Christian shows with her by-then husband Jakob Petrén and released an album as a vocalist with the Swedish group Arose. In 2005, a handful of songs featuring vocals by both Jenny and Linn were recorded. At the end of 2005, the band reunited, without Linn, for several live performances at the Night of the Proms in Belgium, alongside other artists such as Donna Summer. Jonas, Jenny and Ulf during a concert in Saint Petersburg, 2007. Ace of Base reunited as a trio to perform their first full-length concert since 1996 in Yekaterinburg, Russia, on November 15, 2007. Further concerts followed throughout both 2008 and 2009; these were mainly in eastern Europe and Denmark, although Singapore and the Dominican Republic were visited briefly. The set list included various songs from their past albums and a new remake of their first single, "Wheel of Fortune". Linn was absent from the tour, and Jenny confirmed her departure from the band. "She hasn't been part of Ace of Base for several years", she said in Se & Hør magazine. The remaining band members promised Linn that they would never ask her to rejoin the band again. While touring, the group performed live a new song called "Sparks from a Fire". While on tour, the band recorded material for a new studio album to consist of seven new songs and seven remakes of old hits. However, this album did not see a release and a new greatest hits set, Greatest Hits, was released on November 12, 2008, instead, reportedly due to record company obligations. The set was their second release with this title. The 3-disc set included one CD with hits, a second CD containing remixes, and a DVD containing music videos. Four re-recorded songs were released from the album in various forms: "Lucky Love 2009", "Don't Turn Around 2009", "The Sign (Freedom Bunch Mix)" and "Wheel of Fortune 2009", which was released worldwide on October 24, 2008, as a digital single. A fifth reworking, "Happy Nation 2009", was released separately as a remix kit. A remake of "All That She Wants" was recorded around this period and featured guest vocals by Britney Spears that stemmed from her own 2007 cover of the song. This remake was never officially released, but leaked online in June 2016. Following the release of the compilation, the band continued to record songs for a fifth studio album, which never materialised, though three tracks from it were eventually leaked on YouTube in 2017.Jenny announced that she was working on her own solo album, which later materialized as My Story. On November 13, 2009, Ulf, acting as a guest judge on Idol 2009, announced that the band was planning on releasing a new album in the beginning of the following year. Ace of Base performing during a fan meeting in Toronto, Canada (2010). In early 2009, Ulf and Jonas met Julia Williamson through a mutual music contact and began recording songs with her. During Ulf's period as a guest judge on Idol 2009, he and Jonas first met Clara Hagman, who was later recruited as a member of the new Ace of Base line-up. Jenny stated that the new line-up would not be called Ace of Base, while Jonas remarked that they would "reform how [they] write the band name". This alternative line-up was later presented with a slightly changed name, "Ace.of.Base", but this was mainly a graphical adjustment used on the cover of their releases only. Jenny said several times that she never left the band. On the contrary, she declared that all four original members were still band members and that, among the four of them, they owned the brand Ace of Base. Jonas noted in an interview that the record companies wanted a new, but not necessarily younger, vocalist alongside Jenny, to which she objected. He also said Jenny had never officially quit the band, but the record companies saw her as a leaving member. Ulf said in the same interview that "the record label demanded that we have two girls singing [...] Jenny wasn’t interested in doing that." Jenny said that neither Jonas nor Ulf had allowed her to participate in songwriting for the band's album. Clara noted that "I’m not here to take anyone's place [...] when I got this chance I understood that not everybody would accept me and Julia immediately". The first release from the new line-up was "Mr. Replay", which appeared on a promotional DJ disc. The song received mixed reviews from critics, who felt it was too similar to their previous material. The first single from The Golden Ratio, "All For You", was serviced to European radio stations in the middle of July 2010, and it was released as a single on September 10, 2010. The Golden Ratio was released on September 24, 2010. The album entered and peaked on the German album charts at No. 20. "All For You" reached No. 38 in the official German singles chart. The title track from The Golden Ratio was planned as a future single in Sweden; however, it was released only promotionally. An acoustic version of the album was also in talks but never materialized. No further singles were released in support of the album. Beginning in 2011, Jonas and Ulf began releasing previously unreleased material to fans via the band's official Facebook page and the website ReverbNation on a semi-regular basis in events they referred to as "Ace Thursdays". Writing sessions for new material took place throughout the same year. This material was to be released under a new name, however, following the band's tour of Canada and Brazil in 2011, new music was put on hold. Ace Thursdays continued throughout 2012, but were discontinued in May 2013. In November 2012, Jenny was quoted as saying, "The rest of the band are doing other things. ... We’re just wishing each other luck at this stage. I have a dream that we’ll get back together, so I don’t want to bang anyone on the head". The official Ace of Base website became defunct in 2013. In January 2014, Julia announced on her official Facebook page that she had left the band in 2012. She later confirmed that Clara was also no longer part of the band, saying on her Facebook page, "I never really left the group, one day I just didn't hear anything from them and it's the same with Clara. Like it went up in smoke; really strange". On May 14, 2014, Jonas announced via Facebook that they were "working on something great" and that "Linn will be a part of it". On July 7, 2014, a remix EP was released, featuring new remixes of "All That She Wants". On September 27, 2014, Jonas announced that members were filming a documentary chronicling the production of "All That She Wants" at Google headquarters. The documentary was aired on the Swedish channel SVT as part of the Hitlåtens Historia series on March 18, 2015. In December 2014 and January 2015, remastered versions of their first four studio albums, in both European and American editions, were released digitally. Each release featured a bonus demo or B-side track. Hidden Gems, a compilation album consisting entirely of demos and b-sides, was released worldwide on March 6, 2015; "Would You Believe" was released as the first single from the album on February 27, 2015. In October 2015, Ulf said of a future reunion, "With the right elements in the next few years, I don’t think it's impossible"; however, in July 2016, Jenny remarked: "We won’t re-form. [...] We’re finished working together but we’re not finished being family together. We have a lot of fun plans in the future but no musical plans". Katy Perry said she wanted her third studio album, Teenage Dream, to sound like "The Sign"; "It's what I said I wanted earlier", she told MTV; "We nailed it: It's roller-skating! It's '90s! It's Ace of Base! It's Cyndi Lauper! It's like all these colors and more". Swedish artist Robyn said she was inspired by Ace of Base for her song "Dancehall Queen", which was produced by Diplo and Klas Åhlund for her fifth studio album, Body Talk Pt. 1. "We were just having fun with that kind of genre music. And the idea of making this song came out of that discussion. It was fun. We really connected on something where music that you might put in one box becomes something else, depending on how you look at it". American alternative rock artist Beck had plans to cover an Ace of Base album as part of his Record Club project in 2009; however, this never came to fruition. Canadian duo Tegan and Sara's song "Closer" was inspired by the music of Ace of Base. Canadian synthpop group Trust cited Ace of Base as a musical influence, stating that "the synthesisers they used were of great influence on me... [their] first two albums [in particular]". American indie rock band Yeasayer called Ace of Base "a seminal influence". American new wave artist Twin Shadow has also cited Ace of Base as an influence. 1998 Midem Fono Award - Most Played Song Of The Year - "Life Is A Flower"
^ Thompson, Erin K. (October 13, 2010). "An Incomplete History of Swedish Pop Geniuses". Seattle Weekly. Retrieved July 1, 2015. ^ Breitwieser, Anne (November 16, 2006). "Singular sensations of the '90s". Vox. Archived from the original on July 2, 2015. Retrieved July 1, 2015. ^ "Dance! Dance! Dance!". Side3 (in Norwegian). Nettavisen. September 22, 2011. Retrieved November 12, 2016. ^ Bauszus, Jens (March 28, 2012). "Sogar Britney Spears wurde in Stockholm entdeckt". Focus (in German). Retrieved November 12, 2016. ^ "Pop/Rock » Europop » Euro-Pop". AllMusic. All Media Network. Retrieved November 12, 2016. ^ "Top 100 Albums". RIAA. Archived from the original on October 18, 2015. Retrieved October 18, 2010. ^ Trust, Gary (July 13, 2009). "Lady GaGa Makes Mainstream Top 40 History". Billboard.com. Retrieved October 18, 2010. ^ Berggren, Jenny (November 30, 2009). "@Jenny Berggren". Twitter. Retrieved October 18, 2010. ^ Westrin, Stefan. "Clara Hagman blir ny sångerska i Ace of Base". arbetarbladet.se. Arbetarbladet. Retrieved June 8, 2016. ^ a b Park, Lesley (July 30, 2015). "Throwback Thursday: 25 Years of Ace of Base". LA Music Blog. Retrieved October 2, 2015. ^ "Totally Addicted to Base!". AceofBase.co.uk. Archived from the original on June 21, 2008. Retrieved October 18, 2010. ^ "Ace of Base GBG". Happy Nation. Archived from the original on September 1, 2005. Retrieved October 18, 2010. ^ a b "Ulf Ekberg (Ace of Base): The Interview". EuroMenTravel. April 7, 2016. Retrieved July 11, 2016. ^ a b c Our Story (Documentary). SVT/YouTube. 1998. Retrieved March 19, 2015. ^ "Ace of Base". MvdBase.com. Retrieved October 18, 2010. ^ Seabrook, John (October 14, 2015). "Mr. Pop". Slate. Retrieved October 15, 2015. ^ "Ace of Base-stjärnan om glamourens baksida". Sveriges Radio. Retrieved March 19, 2015. ^ Pitzonka, Bill (May 6, 2003). Platinum & Gold Collection (Compact disc booklet). Arista. ^ "Ace of Base FAQ". Archived from the original on April 8, 2000. Retrieved April 5, 2015. ^ "Global Music Pulse - 2002 in Review". Billboard. December 28, 2002. Retrieved September 26, 2016. ^ Berggren, Jonas (November 10, 2010). "Yes! You know on for example Da Capo I couldnt do much promo..." Facebook. Retrieved June 7, 2016. ^ "Ace of Base - Beautiful Morning (SKL Show) 2002". YouTube. 2002. Retrieved June 7, 2016. ^ "Ace of Base - Make My Day (Commentary) [5 of 16]". YouTube. March 8, 2015. Retrieved October 9, 2015. ^ Olausen, Tonny (November 2007). "Vi Elsker Danmark [We Love Denmark]". Se & Hør: 20–21. ^ a b Rothman, Michael (October 8, 2015). "Where Are They Now: Ace of Base". ABC News. Retrieved October 12, 2015. ^ AcerStan (June 15, 2008). "New song performed at Rock Under Broen". The Ace Boards. Retrieved October 18, 2010. ^ "Ace of Base - Sparks From A Fire (Live in Vantaa)". YouTube. October 6, 2008. Retrieved October 18, 2010. ^ Ace of Base come to Bulgaria (radio interview). April 18, 2008. Retrieved October 9, 2016. The album will contain 7 remakes and 7 new songs. The reason why we decided on those remakes is that most of our hits are now 20 years old. Back then we really enjoyed electro music, BUT, electro music was not what the record companies liked and when finally we released our first album the songs were more or less pop-reggae, which we also liked. ^ "Ulf's Letter Part 1". Archived from the original on December 16, 2008. We have done a few remakes of our biggest hits and three of those will be released on different AoB Greatest Hits albums. WOF 2009 and Don't Turn Around 2009 being the two first followed by The Sign 2009. We never wanted another Greatest Hits to be released but we had no choice being the last obligation in the contract. This has also changed our original New album release plan. ^ "Wheel of Fortune 2009". Playground Music Scandinavia. Archived from the original on May 23, 2009. Retrieved October 18, 2010. ^ Lacroix, Jeremiah (June 3, 2016). "Quand Britney Spears reprenait All That She Wants avec Ace of Base" (in French). Tetu. Retrieved June 7, 2016. ^ aceofbase (November 16, 2007). "Ace of Base in the Studio Oct 2008". YouTube. Retrieved April 9, 2012. ^ Marko. "Marko: Jenny Berggren slingrar sig". Marko-saavala.blogspot.com. Retrieved April 9, 2012. ^ a b "The Ace of Base Interview". www.scandipop.co.uk. Retrieved November 1, 2010. ^ a b "> Official message by JONAS !!". The AceBoards. Retrieved April 9, 2012. ^ Stefan Westrin 026-15 93 46 stefan.westrin@arbetarbladet.se. "Clara Hagmans spellista - Spellistan". www.arbetarbladet.se (in Swedish). Retrieved April 9, 2012. ^ "Blandat: Jenny Berggren om Ace of Base framtid - TV4 Play". Tv4play.se. Archived from the original on July 28, 2011. Retrieved April 9, 2012. ^ "Förkväll -Hur är det att jobba med farbröder?". November 19, 2010. Archived from the original on November 29, 2010. ^ "QUESTIONS, No. 15..." Facebook. Retrieved April 9, 2012. ^ "The original..." Facebook. Retrieved April 9, 2012. ^ "Oao. You are wrong..." Facebook. Retrieved April 9, 2012. 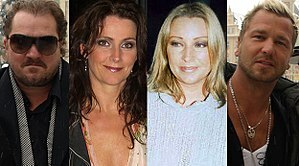 ^ "Jenny Berggren om Ace of Base-kollegornas svek: "De ville inte ha med mig"". Aftonbladet. October 18, 2010. Retrieved April 9, 2012. ^ DJ Promotion CD Pool Pop 126 (compact disc). 2010. ^ Bain, Becky (July 14, 2010). "The Sign That The 90s Are Back—The Return Of Ace Of Base". Idolator. Retrieved September 28, 2015. ^ Welch, Michelle (July 14, 2010). "Ace Of Base hits replay on itself with "Mr. Replay"". A.V. Club. Retrieved September 28, 2015. ^ "Ace of Base - The Golden Ratio (New single for Sweden)". YouTube. October 27, 2010. Retrieved September 27, 2014. ^ Ace of Base – The Golden Ratio (CD-R). Playground Music Scandinavia. 2010. SE-VJH-10-01404. ^ Veevers, Brendon (April 19, 2015). "Interview: Ace of Base". Renowned For Sound. Retrieved October 2, 2015. ^ Berggren, Jonas (February 15, 2011). "First writing session on Skype today..." Facebook. Retrieved October 2, 2015. ^ Ekberg, Ulf (February 3, 2011). "Another writing session in the studio..." Facebook. Retrieved October 2, 2015. ^ "New girls were hated when they replaced Jenny Ace of Base" (in Swedish). Aftonbladet. November 7, 2015. Retrieved July 11, 2016. ^ "Ace of Base Concert Setlists & Tour Dates". Setlist.fm. Retrieved July 11, 2016. ^ Garratt, Rob (November 6, 2012). "We speak to Mixtape Rewind '80s and '90s festival headliners". timeoutabudhabi.com. Retrieved March 3, 2013. ^ "Från Björn Skifs till Icona Pop". SVT.se. SVT. February 13, 2015. Retrieved February 26, 2015. ^ "Ace of Base: Hidden Gems". apple. March 6, 2015. Retrieved January 28, 2015. ^ "Would You Believe: Ace of Base: MP3 Downloads". Germany: Amazon.de. February 27, 2015. Retrieved March 2, 2015. ^ Adams, Cameron (July 6, 2016). "Seeing Ace of Base's Jenny Berggren is the closest you'll get to a return tour". News Limited. Retrieved July 11, 2016. ^ "Lady Gaga Talks "Fame Monster," Freakishness". Billboard.com. November 25, 2009. Retrieved October 18, 2010. ^ Lester, Paul (November 20, 2009). "Lady Gaga The Fame Monster Review". BBC News. Retrieved February 7, 2010. ^ Cinquemani, Sal (November 18, 2009). "Lady Gaga: The Fame Monster". Slant Magazine. Retrieved January 31, 2010. ^ Petridis, Alexis (October 23, 2008). "Lady GaGa: The Fame: Review". The Guardian. Guardian News and Media. ^ Elias, Matt (September 23, 2009). "Katy Perry Wants To Make New Music Her Fans Can 'Roller-Skate To'". MTV. Retrieved October 18, 2010. ^ "Katy Perry Excited For Her New Summer Record". FMQB. March 29, 2010. Archived from the original on April 5, 2010. Retrieved October 18, 2010. ^ Suarez, Jessica (May 10, 2010). "Progress Report: Robyn". Stereogum. Retrieved July 10, 2010. ^ Breihan, Tom (July 13, 2009). "Interviews: Beck". Pitchfork Media. Retrieved March 18, 2015. ^ Trunick, Austin (January 21, 2013). "Track-by-Track: Tegan and Sara's Heartthrob Part One". Under the Radar. Archived from the original on February 14, 2015. Retrieved April 4, 2015. ^ "Trust: "Ace Of Base Were A Big Influence On Me When I Was Little"". Playgroundmag.net. June 7, 2012. Archived from the original on September 6, 2015. Retrieved March 29, 2015. ^ "Yeasayer's Anand Wilder: Ace of Base is kind of a seminal influence for us". CityPages. August 21, 2012. Archived from the original on May 29, 2013. Retrieved June 9, 2013. ^ Partridge, Kenneth (March 16, 2015). "Ace of Base Founder Discusses 'New' Album, Shares the Stories Behind the Band's 5 Biggest Hits". Billboard. Retrieved March 18, 2015. ^ a b "Grammy Sweden 1990" (PDF). ifpi. Archived from the original (PDF) on August 11, 2010. Retrieved November 16, 2010. ^ "Bravo magazine archive–Otto awards 1993". BRAVO. Retrieved February 1, 2010. ^ "Echo Preisträger". Echo. Archived from the original on July 5, 2009. Retrieved November 16, 2010. ^ "BMI Awards". BMI. Archived from the original on February 5, 2010. Retrieved February 1, 2010. "Never Gonna Say I'm Sorry"
"C'est la Vie (Always 21)"
1995: "Gangsta's Paradise" – Coolio featuring L.V.